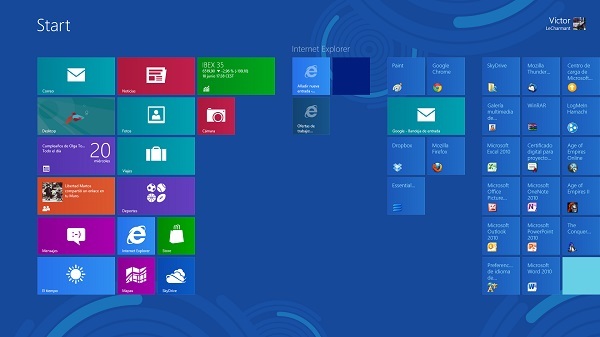 Windows 7 vs Windows 8, head to head comparison, Which one is better? Although still a bit early to talk about the performance of Windows 8, considering that there are still months and then comes the final version, the output of the previous version of this system can get a general idea of this platform to hit the market to pick up the control of Windows 7. The legacy of the fastest-selling operating system of Microsoft's history is a challenge of paramount importance, and Windows 8 has already presented some arguments p ara to convince the public. We present a first comparison between the two systems in its main aspects. This is the main change that we have to face when opting for Windows 8 . The system would be a break with what we have seen so far on Windows, its main focus away from the desktop. Metro interface (you can see in the picture above) divides the various applications and system shortcuts in blocks that are distributed the screen. This is an inspired interface on Windows Phone and is designed to meet touch-enabled devices (although its use with the mouse is rather light). The main advantages of this interface is that the main elements of the system have a high visibility (blocks also serve as alerts to show things like the mail received or developments in social networks). Specifically, users who often use Facebook or Twitter will surely be the most valued the new interface, because its integration is really good. Although Microsoft has taken a big step to shift the focus to an interface beyond the desktop environment we are used, the desktop pervivirá as an application within Metro. The interior of this application will be practically the same as we already know, except for one detail, however, can be decisive: it leaves the Windows start menu. With this decision, Microsoft forces the user to gradually adopt the new primary interface if you want to have Windows 8, as the emptiness of this menu should be filled with the new way to navigate. The transition often be difficult (it was in my case) and even then they begin to find positive aspects would not recommend to users who will use almost exclusively to bet on the Windows desktop 8. One way to remedy this lack is in the advanced command menu that appears when we press the right mouse button in the lower left corner. Through it you can reach the control panel or program uninstaller. Under the new desktop Windows 8, another difference that we find will be the browser. Although the base is the same, at the top we find a toolbar similar to that joined Microsoft in the latest versions of its office tools Office. Ribbon bar, very visual and with large icons. Its use is fairly intuitive and icons are better distributed than in the case of Office. However, it is a matter of taste. What we do is an interesting development is the management of file transfers. 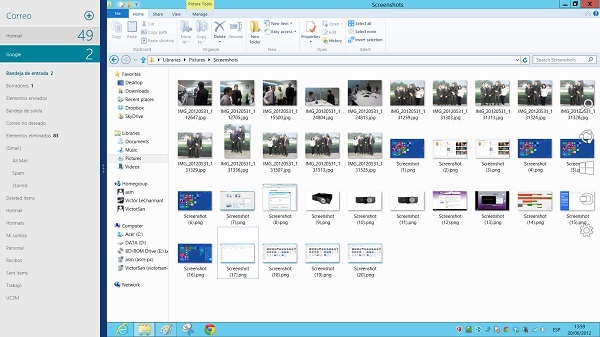 With Windows 8 can transfer multiple files or sets of different files from one window, and you can even control the priority of each transfer, pause transfers or see how fast they wear. The base of multitasking in the two systems is similar. The easiest way is to manejarnos between applications press "Alt + Tab" and vary between different options. 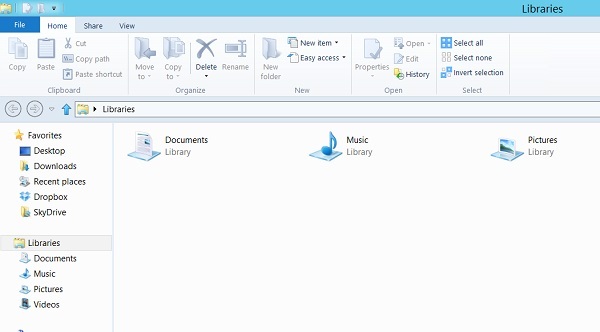 However, Windows 8 incorporates a lateral stripe on the left side of the screen (just keep the mouse in the upper right and then down down) which appear as thumbnails in the open applications. When we click on them are placed on the screen. If you routinely use a single application on the screen, this system is a breakthrough. When it really makes sense is if we use the ability to split the screen for two applications to Windows 8 counts. The system allows us to place an application to "full screen" and the other in an elongated strip to the left or right of the screen. And in this case, you can drag the thumbnail on the left or right of our panel to place the application where we want and then play with the position of the applications. It is a very attractive option for users who often use many applications at once. Windows 8 improves startup speed you get with Windows 7, but in testing we have done this improvement does not become very large (we are waiting to perform the same test with a built-in SSD, because so far only was carried out with a hard drive). A great success that is behind Windows 8 is that the operating system works with the same requirements of the system that had Windows 7. However, we have received a comment from a reader telling us not able to install Windows 8 despite having Windows 7 because a "PC compatible", so it's likely that Microsoft has ventured too quick to announce this full compatibility. The new system interface will bring manufacturers to work with devices of various kinds. The opening to the tactile world provide the creative efforts of the various brands, and we can go one step further in the field of integration. The first announced Windows 8 teams have joined the craze and quipos hybrids between tablets and laptops, the latest being Microsoft Surface , the first convertible tablet designed by Microsoft. In short, it is premature to address some issues that require comparison between Windows 7 and Windows 8, such as the stability of the system or its overall performance. 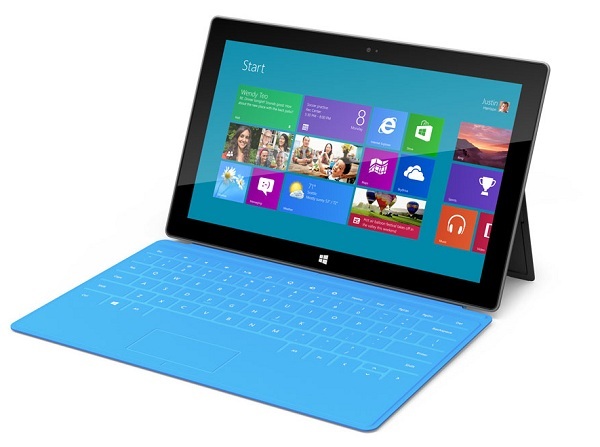 What do you think of the comparative and general Windows 8? Do you think there are some important aspect has been left untouched?